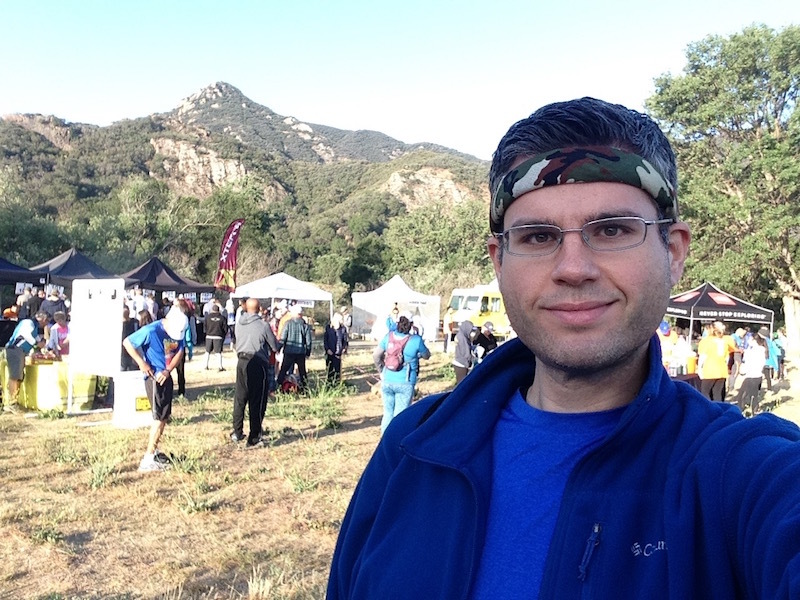 I Survived My First Trail Race! 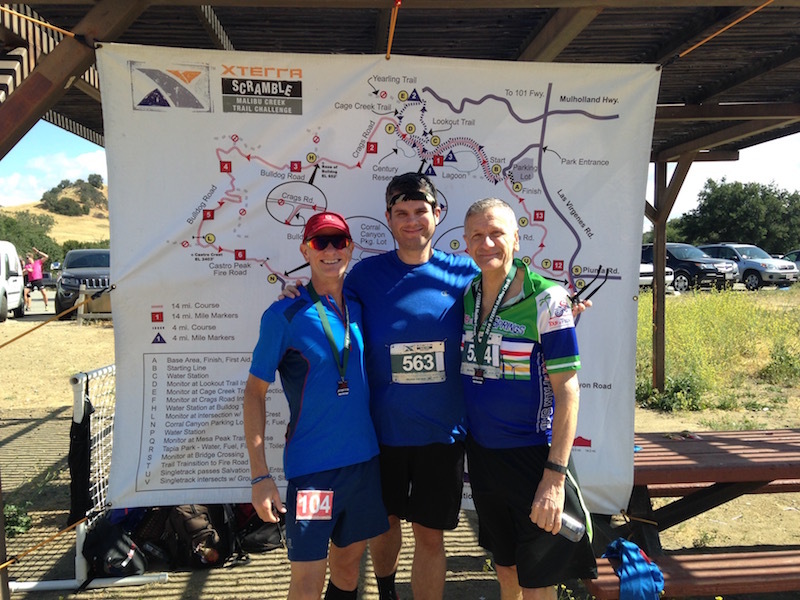 (XTERRA Malibu Creek Race Recap) | Keep It Up, David! So there’s a wee bit of backstory here: My friend Jeff (a frequent figure on this blog, often featured in posts about long or unexpectedly challenging physical outings) is a champion trail runner. He has oodles of medals from trail races. 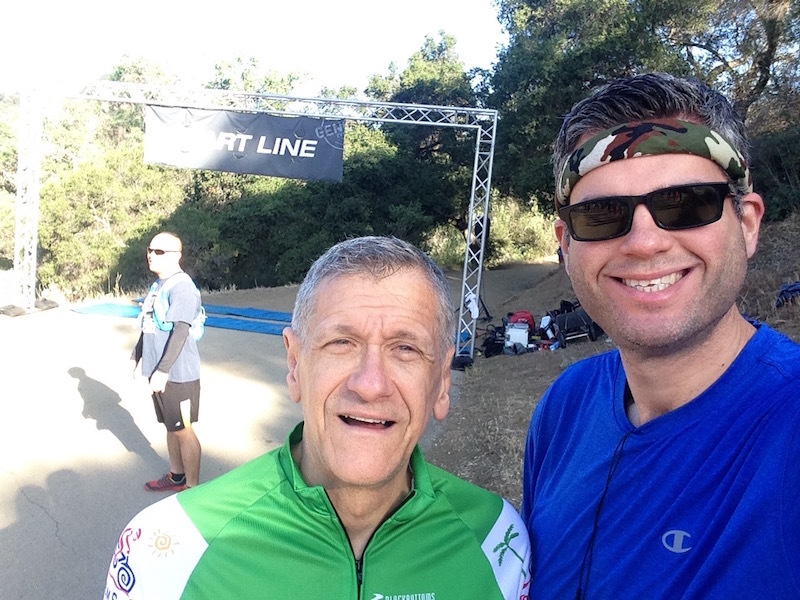 He’s been bugging me for years to do a trail race. And I’ve always said no. 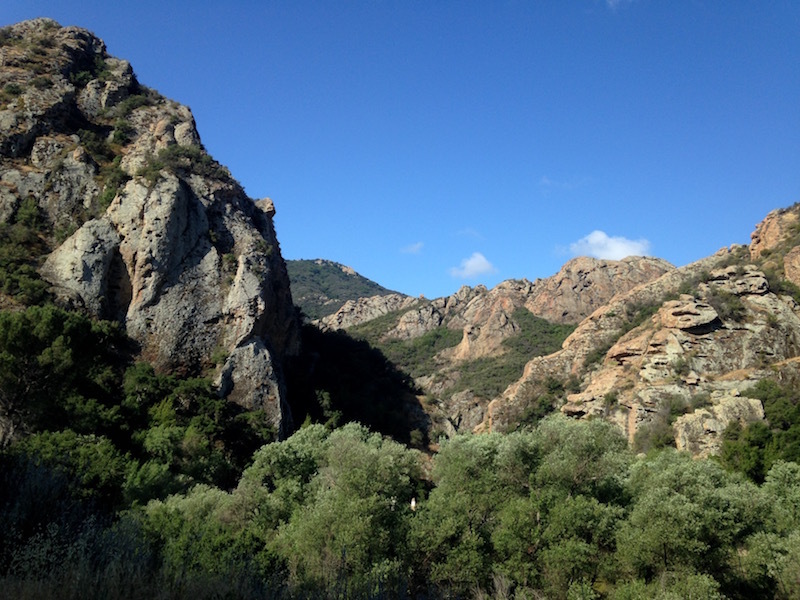 Even though I have a few 5k and 10k races (on pavement) under my belt, I’m not the biggest fan of running, and I’m just not that excited by the thought of racing up, down and around mountains on narrow, uneven, rock-filled trails. Last month, Jeff and I had dinner with a mutual friend, Mike. Mike had a very frightening medical scare a few months ago, which landed him in the hospital for a few days, but even that won’t deter him from doing a certain upcoming trail race. Jeff chimed in: “David, that’s the one I was telling you about!” Later, via email, Mike invited me to the race. Well, crap. Now there were two friends egging me on! Maybe it was time to bite the goddamn bullet and do a trail race. So I signed up. They broke the 6k runners into two waves: the competitive runners went first, followed three minutes later by the more casual runners. Since I’m new to the sport, I picked the second group, since I wasn’t sure what to expect. I got into position right at the front of the pack, and took off when the air horn sounded. The first part of the course was on a fire road. It’s unpaved, but as wide as a two-lane road, so it’s easy to pass and there’s plenty of room. Then, we veered off the fire road onto a single track trail. This was a true trail in every sense of the word: only a couple feet wide, lots of curves, some switchbacks, and plenty of rocks, tree roots, and other trip hazards. There’s etiquette for passing on a single-track trail. You have to announce yourself (“Passing on the left!”) and you’re supposed to wait for a verbal OK from the person you’re passing, as a safety precaution. While I was passed on the fire road, not one person passed me on the uphill part of the single track trail. In fact, I passed a ton of people – well over a dozen, including two of the guys that passed me earlier. It was super cool to realize that I excelled during the uphill climb – the most challenging part of the course. Thank you, years of stair training! There was a sizable elevation change, too: nearly 700 feet. To put that in perspective, imagine a 1.85-mile long ramp to the top of a 50-story building. This race was similar to running up and down that ramp. RELATED CONTENT: Check Out Recaps From My Other Races! A little while in to the main ascent, I realized the guy behind me was using me to pace himself. He stayed 10 feet behind, without ever passing me. His presence pushed me to go faster. I liked it. The downhill part of the single track required a lot of focus. If I was gonna fall, it’d be during this part. There were some sharp twists and turns, and I managed all of them without even stumbling. Near the end of the downhill part, our trail converged with the 12k course, and a bunch of speedy 12k racers started passing me, and of course it was always at treacherous moments – when the trail was particularly rocky, or when I was precariously close to a sizable precipice. But everyone was respectful of passing etiquette, and I never felt unstable or unsafe. The dude that was pacing off me flew by me after one of the 12k speed demons passed us both – he clearly was ready to pace off someone faster – and I grew determined to catch up to him and beat him to the finish line. Establishing that goal mid-race turned out to be smart, because it provided a nice distraction from the fact that I was getting tired and achy. But the goal soon evaporated as the guy got further and further ahead. After a while, I couldn’t see him at all. Eventually, the trail connected with the fire road, and the final part of the race was running back along the same fire road we started on. Because the road was smooth, I was able to look around a little more, and take in the gorgeous views. I even managed to work my phone out of my pocket and take a picture while running. And it turned out OK! I kept chugging along, even though I knew I slowing down. 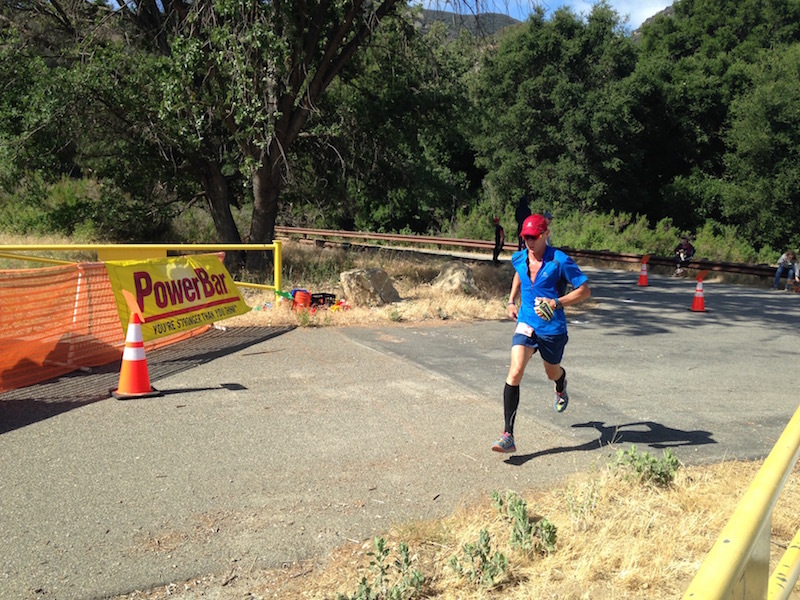 I was determined to finish strong, even though the fatigue and soreness were increasing. About two hundred yards from the finish line, I guy I recognized passed me. He was one of the first guys that passed me at the beginning, and then I passed him on the climb. And now this mofo was gonna try to beat me? NO WAY. I kicked it into a gear I didn’t know I had, and started running alongside him. I was gonna put up a fight until the very end, and cross the finish line first. …I did it. 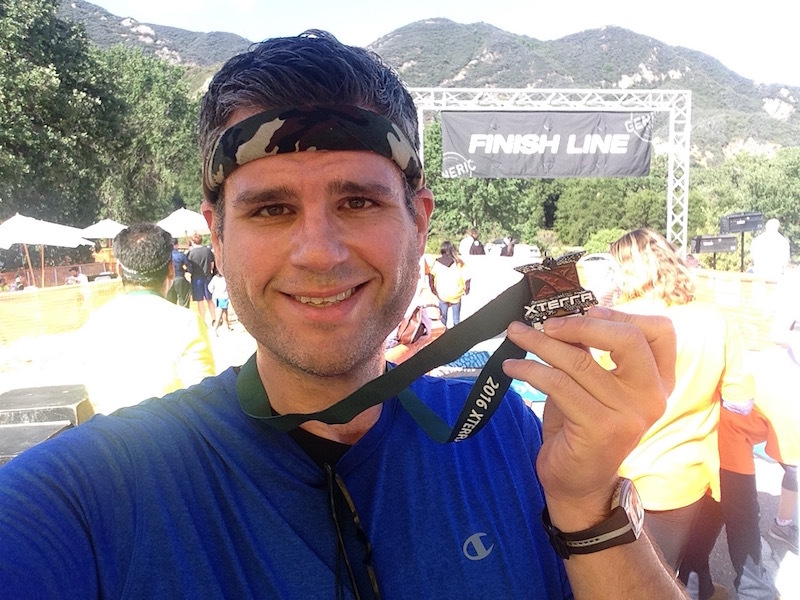 I finished my first trail race! 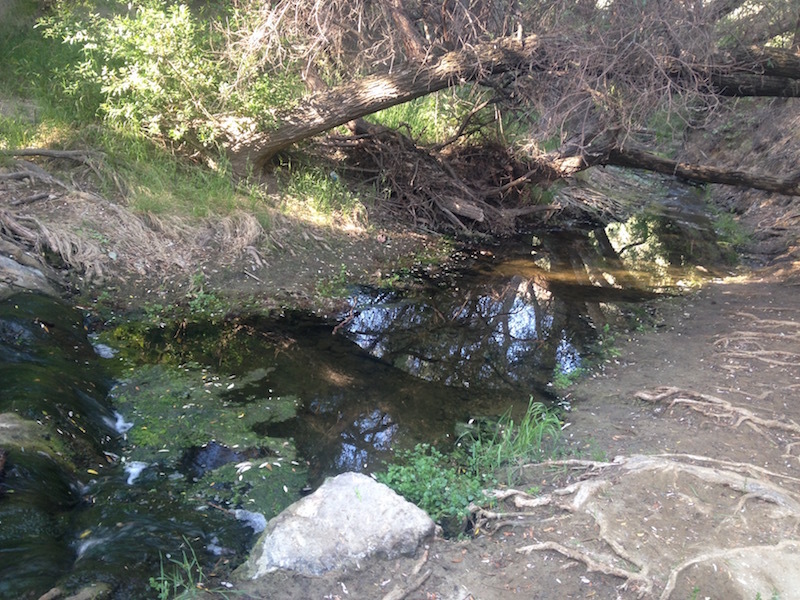 I guzzled a bottle of water, and started walking backwards along the course, along the shoulder of the fire road. After about 100 yards, I saw Mike coming around the corner, and I ran alongside him as he crossed the line. A little while later, they made an announcement that the leaders in the 22k race had only two miles left. I knew Jeff would be one of the top finishers, so I staked out a spot at the final curve, and snapped a nice pic as he ran by. I’m glad that did this trail race, and I’ve told Jeff that I appreciate him pushing me for so long to give trail running a try. It was a good morning for me, and I’m proud that I did so well at something my first time doing it. Will I do it again? I don’t know. I’m not scouring the interwebs looks for my next race, but as they say, never say never. And you know what else I like to say, right? This entry was posted on Tuesday, May 24th, 2016 at 1:31 am and is filed under Uncategorized. You can follow any responses to this entry through the RSS 2.0 feed. You can leave a response, or trackback from your own site. Congratulations for racing outside your comfort zone of stairwells and enjoying the beautiful day and doing so well. It sounds potentially quite treacherous, especially when you said there can be passing near a precipice!! Holy Cow!! Precipice might be an overstatement. But, then again, who knows how far those steep inclines went? I was too busy focusing on the trail in front of me! Proud of you for doing this race! I knew if I bugged you enough, you’d eventually give in, and do well, even enjoying the new challenge! I’m sure stairs will remain your main competitive sport to focus on, but I do think you’ll be back for more trails in the near future! I was glad to see you at the trail race, great job and see in the stairs soon. Great to see you too, Esteban! See you soon. Congratulations. Trail races can be so fun and also so difficult. Nothing like feeling that lead for a few hundred meters too! The pictures are so beautiful too! Thank you! It was a fun, challenging morning, that’s for sure.